Facebook officially announced that its chat feature supports XMPP (Extensible Messaging and Presence Protocol), an open source instant messaging standard. It means that some multiple service instant messaging client like Adium, iChat, or Pidgin can be logged in with Facebook Account to chat with your friends on Facebook. 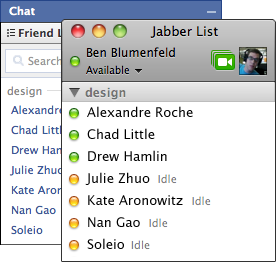 Official full support already available for AIM and Meebo (multi-protocol web messenger). Simply connect your Facebook account with the instant messaging client of your choice and start chatting. You will not need to stay logged in to Facebook.com to continue to access your Facebook friends. To get started chatting, visit the Facebook Chat section of the site tour for instructions on how to connect and for examples of instant messaging clients you can connect with.